The last place in Boston you would think of is turning out ramen as a weekly special. That’s right, SweetCheeksQ, a barbeque joint in Fenway, is making a success out of a niche demand. They’re churning out one hundred bowls of speciality ramen Mondays at nine PM for one hour every week, and the menu is limited to one option with appetizers, which they change about twice a month. 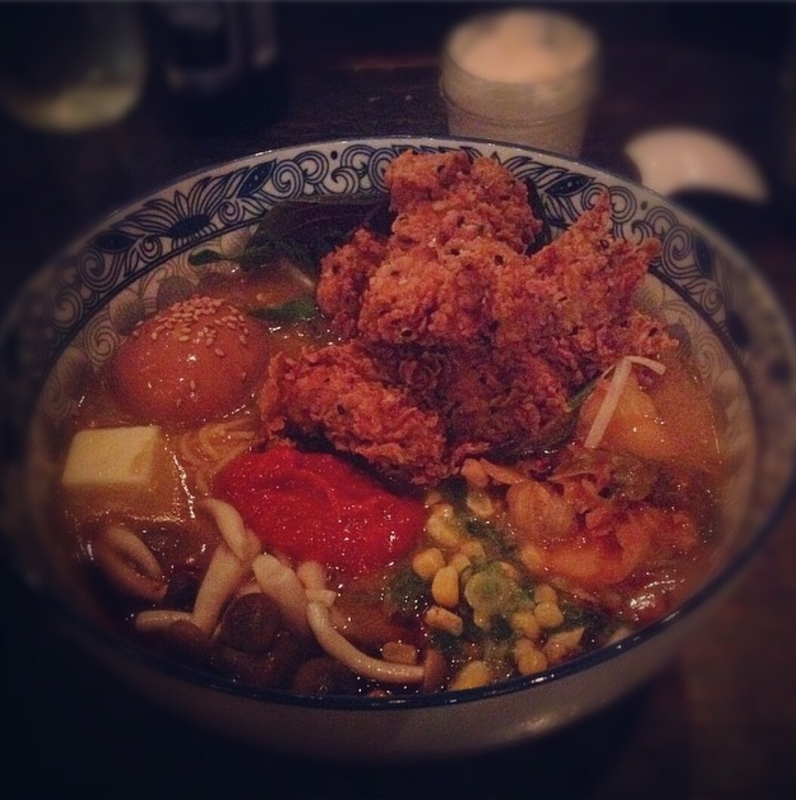 The fried chicken ramen was the first ramen I tried. It came with sesame fried chicken tenders, house-made bok choy kimchi, sauteed shiitake mushrooms, red and white miso, butter, and a chili paste made with mashed black beans. It was a fun, hip, delicious fusion of ramen and barbeque. The sesame fried chicken really made the ramen. My second visit, we had the smoked duck confit ramen which I enjoyed immensely. It had a five-spiced egg, bok choy, house kimchi, pickled shimeji mushrooms, scallions, butter and spicy garlic oil. There was a generous portion of tender duck, but I greedily wished there was more crispy skin since there’s never too much crispy skin! The broth was very good and coated the noodles well. It was made with duck bones, chicken bones, dried mushrooms and miso dashi. The broth was “simmered for 36 hours and finished with secrets and love” according to the menu. My advice is to definitely queue up between eight to eight thirty PM so you don’t miss out. The customer service is really good because they offer you complimentary popcorn or shrimp chips in take out boxes while you wait and will take drink orders as well. The appetizers that are offered regularly rotate but I have seen the buttermilk biscuits and some form of wings as appetizer staples. I heard that they served a salt and pepper short rib that sounded amazing. For $15, SweetCheeksQ definitely enters the ramen pricing spectrum slightly on the higher end, but the portion size is definitely larger than most. Also, they will allow you to take home any leftovers if you would like. Most ramenya will not allow you to do this. The ramen is filling and the broth is very flavorful. The soft-boiled egg adds a richness that I always enjoy. The pickled vegetables add a lovely tangy crunch. The only thing that I did not really like is that one of the times I visited, the straight yellow noodles they used were a little too soft, probably from waiting to be served after being plated. They’ve also had lobster miso ramen, vegetable ramen, tonkotsu ramen, which I would love to try if they have it next winter. 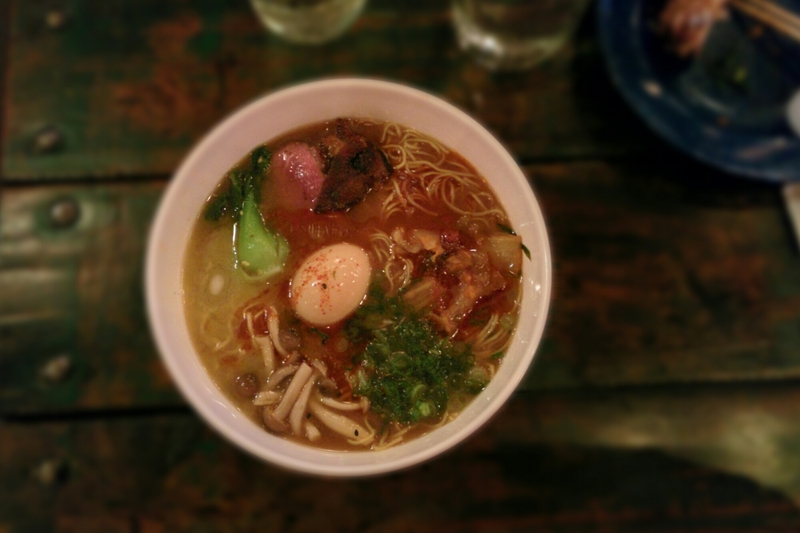 I highly suggest checking out SweetCheeksQ’s Monday night ramen special. The queue is long so come early and they only have one hundred bowls to serve up, but it’s definitely slurp worthy. If you get a chance, swing by tonight and grab a bowl before it ends for the season next week. If not, come out another night as they serve up some great barbeque.